THE MAKING OF A CUSTOM STOCK! Let me first preface this thread by stating that my first love has always been and always will be the World of the Shotgun Shooting Sports. Unfortunately medical conditions and the loss of the sight in my left eye has made me physically unable to compete any longer… Several years ago, when these medical problems first started, I looked for other ways, to continue my passion for shooting. 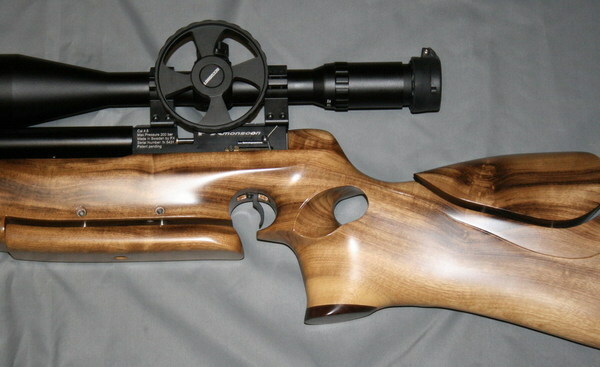 Thus I entered the world of High Power Air Rifle Shooting….. Over the years I have acquired a very extensive collection of High Power, PCP (Pre Charged Pneumatic) Air Rifles that are manufactured all over the world. No longer doing any restorations’ to my own Shotguns (they have all been completed). 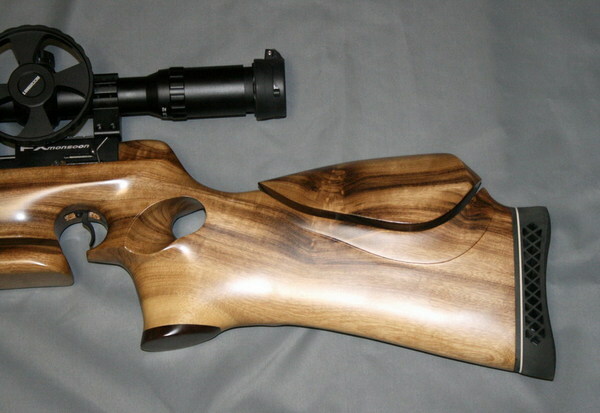 I decided I wanted to have a custom FT Stock (Field/Target) made for one of my Air Rifles. The Rifle that I selected is my Swedish Made, FX Monsoon. It's a .22 caliber semi-automatic Air Rifle, with a synthetic thumb hole stock. 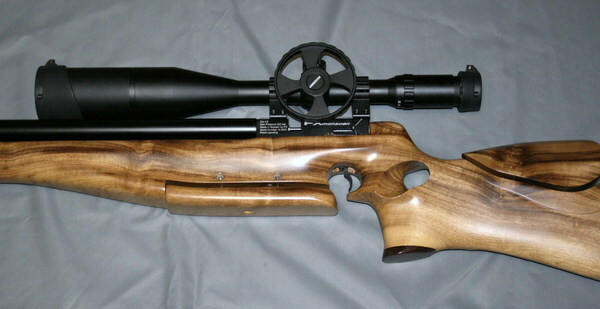 I searched the web to see if I could find any stock makers that specialized in Air Rifles. After several weeks of searching and comparing costs and styles I decided on Paul Bishop Custom Air Rifle Stocks to make my stock. You can contact Paul direct at his Web Site... http://www.paulbcustomstock.weebly.com/... He will be able to answer any question that you may have in regards to having a custom stock made. Paul went way out of the norm to discuss all options available, what thier functions were and what options would work for me. After we agreed on the style and options, it was now time to find a blank of wood for the project. Paul is a master wood craftsman who has spent the last 25 years creating and finishing Custom Guitars. He knows his woods and how to finish them, as the pictures in this blog will attest to. Everyone of Paul's Stocks is A Free Form, Hand Carved Creation. No two of his custom stocks look the same. Paul does not keep a large inventory of blanks in stock. He prefers his customers purchase the blank they want and then send it to him. He gave me several different web sites to look at, that offer a wide selection of all different types of woods. I had several weeks to find a blank, because Paul had a couple of projects ahead of mine. I was trying to keep the total cost of the project under $1,000. In today's day and age, it is almost impossible to do so. I started to look at the web sites that offered stock blanks for sale. I could not believe how many different types of woods, variations and grades that where available. 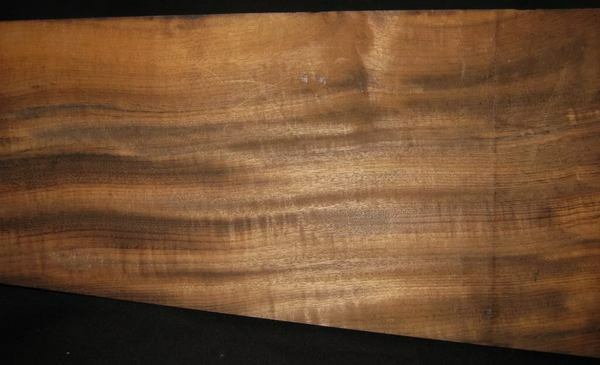 I know I wanted a type of wood with really nice grain and color that would really POP when it was finished. Every time I found a blank that I liked, I would send a picture of it to Paul for his opinion. He would get back to me right away with the pros and cons of the blank. Unfortunately every blank that I liked pushed my project budget way over the top. I couldn't believe how much money some of these blanks cost. Step #4:... Let the Work Begin! Paul and I had decided that the muzzle and the grip area of the stock was to have some nice contrasting wood to set off it's lines . I also wanted the stock to have a Pac Myer Pigeon Recoil pad. I didn't care for the Morgan type recoil pads that where being used by most of the Air Gun Stock makers. Paul emailed me the following photo showing the preliminary layout, several samples of the wood accents and the recoil pad. We selected the Marble Walnut for all of the accent pieces. The next steps in the project was to cut the design out on the band saw. Making the cuts for the adjustable comb and adjustable forearm. Add the operating hardware for the comb and forearm and gluing up the accent pieces. The picture shows all of these details and now the stock is ready for the hand carving and shaping. The most artistic part of the project. It amazes me how much the stock really takes shape going from one step to the next step. You really get a feel of what the finished project is going to look like. The following two pictures show the stock fully shaped and ready for the next step. The sanding stage. Paul told me he will spend the next four to five days, just sanding the stock to get it ready for the final finish. 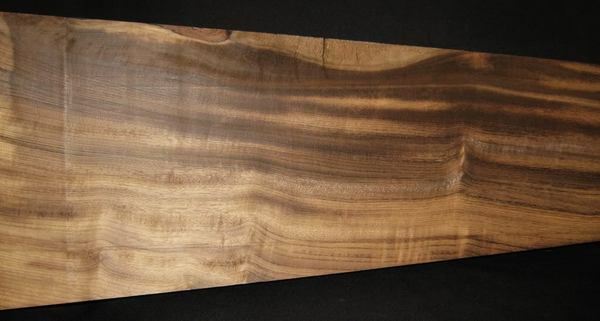 You can really see the the grain and the color of the Chocolate Myrtle. I was told by Paul, that Myrtle wood is an extremely hard wood. So, it takes longer for the sanding process to be completed. Now that all of the sanding has been complete, Paul sent this set of pictures showing the first coats of sealer applied to the stock. Once this stage is completed, than the final finishing begins. With only the sealer coat on you can really see the grain and color really Pop! Step #5:... The Finished Product! 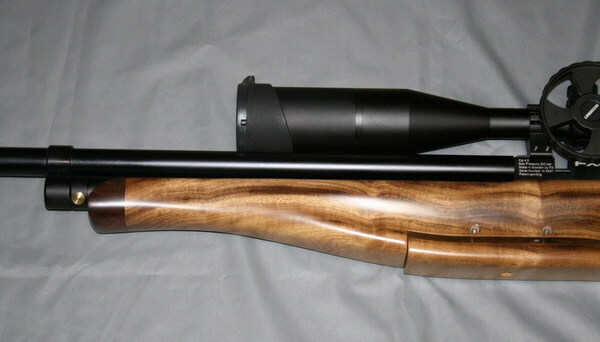 Paul just emailed me the pictures of the completed rifle. WOW!...This is way more than I expected. Absolutely FANTASTIC!. I am picking up the rifle on Saturday...Can't wait to see it in person...I will install the F/T Scope and add some pictures.. 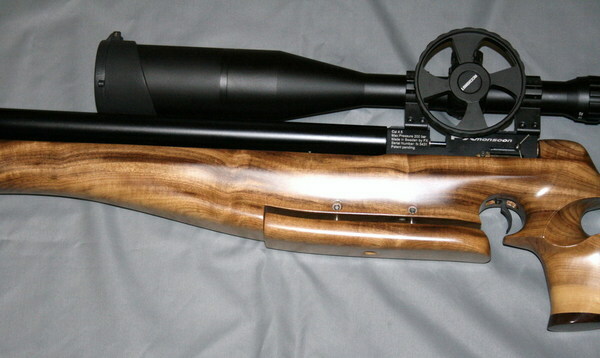 Here are some photo's of the finished Air Rifle with A Leapers 8-32 x 56 Swat Scope with Side Wheel.